Sanding jobs are frequently done by joiners, carpenters, interior designers, staircase builders, model makers, and by others in the area of woodwoorking. Sanding in these cases is still mostly done by hand, since conventional contour sanders are too expensive and too large for many craftsmen. The BRAUN Contour & Form Sander K 40 is closing a gap in this respect. Thanks to the ingenious construction design, this solid machine is compact and low-priced, has a flexible sanding potential, and short preparation times. 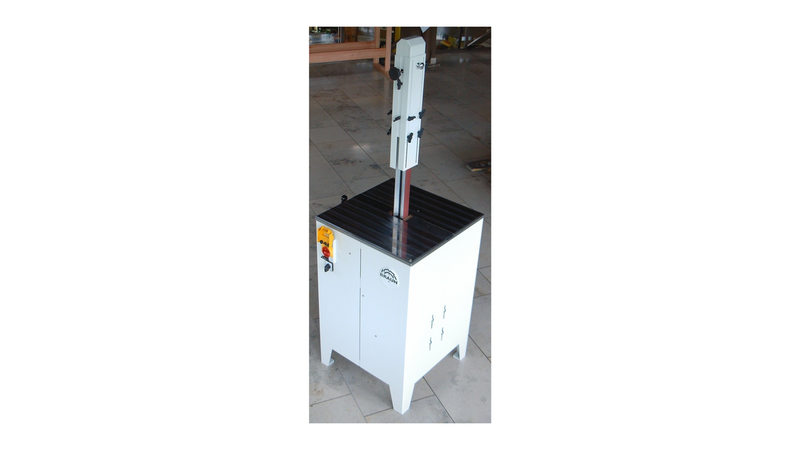 Due to the optional moving gear, the sander is always available "on site". The sanding belt of the BRAUN Contour & Form sander K 40 runs over 2 sanding rods that lie parallel flat on each other. When 2 different rods are used (eg one flat and the other round), 2 different forms can be sanded by mere alternate changing of belt direction (without the change of rods). If yet other contour variations are desired the rods can easily be changed. Variably adjustable sanding jib for various sanding angles up to 45 degrees enables sanding of contours, edges, inward cups, and other unusual shapes. The absence of an obstruction arm support enables sanding of workpieces of any length, in unrestricted dimensions. The sanding height is impressive 400 mm. The sanding belt cover is adjustable to the workpiece&apos;s height, the table is sturdy: both contributes to optimum safety.